The rest of Lou’s episode, however, is charming, and it’s nice to see him and Bud Abbott on good terms since they had periods wherein they didn’t get along too well over the course of their careers together. It’s also especially relevant to me as a resident of New Jersey who lives within half an hour of Paterson, Lou’s hometown – I love learning about my own state’s history, and the little tidbits about life in Paterson that can be gleamed from watching this are really neat. Here’s the video! If you don’t want to hear about Butch, as I’m sure Lou and his wife didn’t, you can skip over that part and nobody will blame you. I rewatched It’s A Mad, Mad, Mad, Mad World for the first time in years last night. (A large portion of the cast of that comic I’m doing appears in this thing, amongst other reasons.) Besides possibly disturbing my parents a little bit by recognizing the way Buster Keaton (who cameos) walked, I did a little bit of thinking last night – and it’s true, comedy really does travel in cycles stylistically. When comedy films first started appearing, Mack Sennett more or less ran the show. Sennett films relied on heavy slapstick – watch anything featuring the Keystone Kops and you’ll see what I mean. Watching Sennett’s Chaplin, Arbuckle and Normand films reveals…basically the same thing. There were no scripts back then – the actors would just go out with the director and a cameraman, find a scene somewhere, and improvise a little story. They’d then add title cards later after the film was edited and cut. Then one day, Charlie Chaplin decided to believe all the critics calling him an artist, and things changed drastically. Films became longer, with proper plots carried throughout them. There weren’t scripts, because there was still no dialogue, but by the middle of the 1920s, the Big Three – Chaplin, Keaton and Lloyd – were well-established, with Harry Langdon more or less keeping up with them (until he decided he was an artist, too, but let’s not get into that now). These films moved away from slapstick and became more situational, with the characters spending most of their time on film trying to get out of bizarre – yet realistic – situations. If we look at the sort of comedy that was popular during the 1930s, we see two or three distinct branches. The first branch, which involves scripts heavily reliant on wordplay and puns, is primarily dominated by the Marx Brothers, but there were quite a few other acts falling under this umbrella, as well. Remember Wheeler and Woolsey? No? Anyway, they were here, too. The second branch involves a return to slapstick. Columbia decided that at the height of the Great Depression what people really wanted to see was three idiots beating each other up for twenty minutes, so they signed these three and set them to work. Apparently Columbia was right, since they turned out to be a massive draw at the box office. The third branch – my favorite – is probably the best-remembered of the three because they seem to be involved in almost everyone’s childhoods, even now. 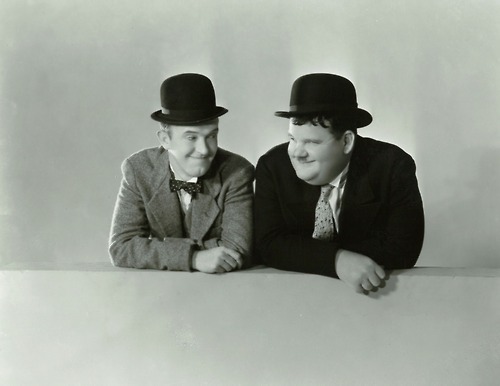 To be fair, the thing that makes Laurel and Hardy so special to me is that the two of them ended up becoming best friends over the course of their careers, which is the most adorable thing ever. From a comedy standpoint, they’re very different from the other two branches because of their pacing. Whilst the other acts relied on quick, snappy dialogue and non-stop cartoon violence, Stan and Ollie took things very, very slowly. They reacted to what happened to them – slowly – and stretched sequences that would have taken other comedians thirty seconds to do out over several minutes. It worked brilliantly. By the 1940s, things needed to be freshened up some, and although the Stooges and Stan and Ollie were still around, it was Abbott and Costello who popped up and grew in popularity during the war years. (This may have reflected the general culture in America at the time, as Bud and Lou’s comedy style was more aggressive.) They hung around in the ’50s for a little while, but Dean Martin and Jerry Lewis picked up the baton from there and brought comedy into more of a screwball direction. At the same time, Bing Crosby and Bob Hope’s Road To… movies were further solidifying the genre. Television comedy also began its rise, with many radio stars eventually making the jump and bringing sketch comedy and sitcoms to the small screen. Mack Sennett would have loved this movie. There’s plenty of slapstick violence in here – the film even ends on a banana peel gag, a staple of the Sennett era. Although there isn’t a pie fight, there’s a bit where an entire gas station is systematically dismantled and destroyed by Jonathan Winters, which is close enough. There’s a ton of situational comedy, too. The entire movie is fueled by one situation – Jimmy Durante’s character hid money somewhere in Southern California under something called a ‘big W,’ and everyone’s attempts to get there first place them into precarious situations: hitchhiking with strangers and ‘borrowing’ their cars, flying an airplane after the pilot passes out drunk, locked in a hardware store basement, and so on. The script is phenomenal. It allows all the comedians making cameos to get their trademark lines in (ZaSu Pitts gets to show off her Midwestern accent as the switchboard operator, Jack Benny gets to deliver a “…Well!” and Joe E. Brown gets to scream “HEEEEEEEEY!” near the end). It also lets the feature players shine (Buddy Hackett’s delivery of “What are you, the hostess?” to Mickey Rooney as they’re trying to land a plane is my dad’s favorite line in the entire film). The script is snappy and rapid-fire where it needs to be and quiet when all the audience needs to follow the plot is the action. For a three-hour movie, the pacing is incredible – you never get bored because the plot never drags for a second, even when the scene cuts to the police station for a breather. You watch this film, and cameos aside, the films of the 1910s and 1920s are back – in color and in a much longer format, but there you go. Styles of comedy tend to cycle around. In the early 1960s, there was a satire boom which started in the UK and made its way to the US. 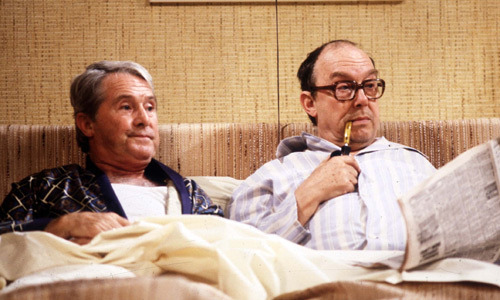 Although Peter Cook and Dudley Moore, who were at the forefront of the movement by being in Beyond the Fringe, lasted as a double act for twenty some-odd years afterwards by moving into sketch comedy, satire itself faded quickly out of vogue, only to return with a vengeance in the 2000s. My brother loves films like Dodgeball. Dodgeball is pure slapstick. Think for a moment about what you like watching. There might just be some older – or newer – films in the ilk of what you’re into. Why don’t you go and check those out for a change and see what you think?